LANSDOWNE, Va. – Despite small signs of progress, state policies nationwide continue to fail to support the needs of high-ability students with financial need, according to a new report released today by the Jack Kent Cooke Foundation. 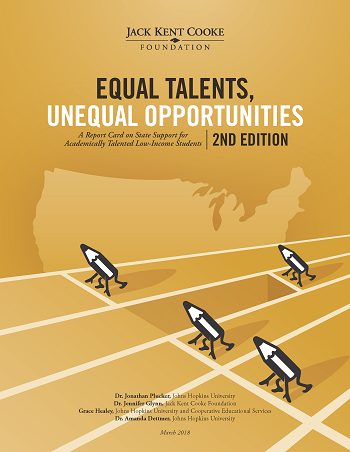 The report, “Equal Talents, Unequal Opportunities, Second Edition” is a follow-up to the first edition, published in 2015, that measures the extent to which states are addressing the needs of high-ability students from low- and moderate-income backgrounds. States were assessed on two measures: excellence, the extent to which states achieve advanced learning outcomes for all students, and closing excellence gaps, the degree to which low-income students are equally likely to achieve high levels of academic excellence as other students. Among the key findings, 14 states received a grade of a B or better for their work supporting excellence. However, no states received a B or better for closing excellence gaps. “Our latest report finds a greater commitment to promising practices, such as policies that require schools to identify talented students. When it comes to closing excellence gaps, however, the results were disappointing. States in general have implemented few policies that should be in place to ensure equal access to advanced learning opportunities,” said Dr. Jonathan Plucker. Plucker is a co-author of the report, and serves as the Julian C. Stanley Professor of Talent Development at Johns Hopkins University and president-elect of the National Association for Gifted Children. Attend to both excellence and excellence gaps. Maximize identification of students to receive advanced learning opportunities. Ensure that all high-ability students have access to advanced educational services. Remove barriers that prevent high-ability students from moving through coursework at a pace that matches their achievement level. Hold local education agencies (LEAs) accountable for the performance of high-ability students from all economic backgrounds. Create a comprehensive talent development plan that guides advanced students through education from K through 12. This second edition of “Equal Talents, Unequal Opportunities” was co-written by Dr. Jonathan Plucker of Johns Hopkins University; Dr. Jennifer Glynn, director of research and evaluation at the Cooke Foundation; Grace Healy of Johns Hopkins University and Cooperative Educational Services; and Dr. Amanda Dettmer of Johns Hopkins University. To view the complete report, visit www.jkcf.org/ReportCard.